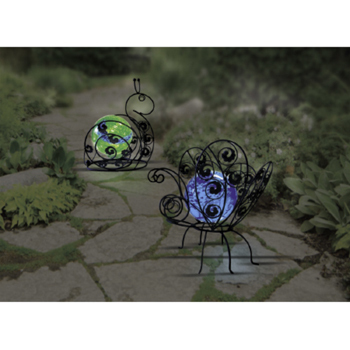 These Solar Glass Wire Critters are made of durable metal with hand blown glass ball and gemmed accents. Art sculpture by day, light by night. Built in photo sensor turns unit on at dusk and illuminates for hours on full charge. LED light provides a soothing light diffusing glow. Rechargeable battery included. Patent pending. 12 inch Height.